As you may have noticed, since Microsoft October 2018 Update, Windows 10 no longer includes basic printer and scanner drivers in Windows installation media, which is one of the big changes with Windows 10 version 1809 update. But don’t panic! You can get the right drivers for your printers and scanners with the solutions in this post. Why does Windows 10 remove inbox printer and scanner drivers? That is to say, if you install the operating system with the Windows 10 1809 ISO file, Windows 10 doesn’t include the set of default drivers for printers and scanners as it used to do. This is said to reduce the Windows footprint and provide more storage space, according to the statement from Microsoft Tech Community. How to install the drivers for printers and scanners? But don’t worry. We’ll help you fix this problem. Try these methods to download and install the full feature drivers in your computer. Though Windows stops providing printer and scanner drivers in the installation file, you can still manually download the corresponding drivers via Windows Update or from the manufacturer website. In this case, you’ll need to connect to the Internet after installing the OS. If you upgrade to Windows 10 version 1809 version, your printers that are previously installed will continue to work as before. Microsoft removes the drivers for printers and scanners from the ISO, but it moves the drivers to Windows Update. So if you perform a reinstallation or clean installation, you’ll need to access to Windows Update in your computer, then download and install the printer and scanner drivers. 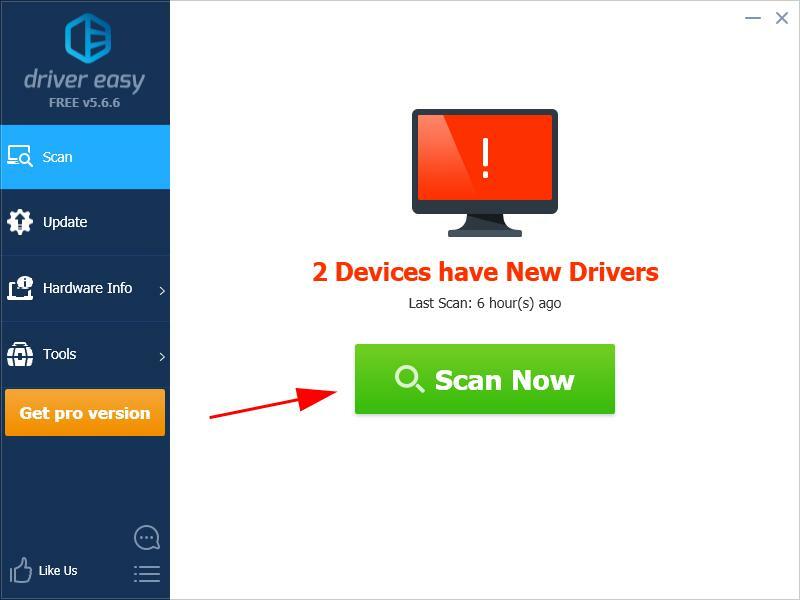 On the other hand, you can also find the driver for your device from the manufacturer’s website. You can go to the manufacturer, search for the driver, then download and install the latest version. Be sure to download the driver that is compatible with your OS. The steps vary from printer to printer, so we won’t cover it here. For example, if you’re using an Epson printer, go to Epson Support center, and find the correct driver and install it. If this method doesn’t work for you, don’t worry. There is something else to try. 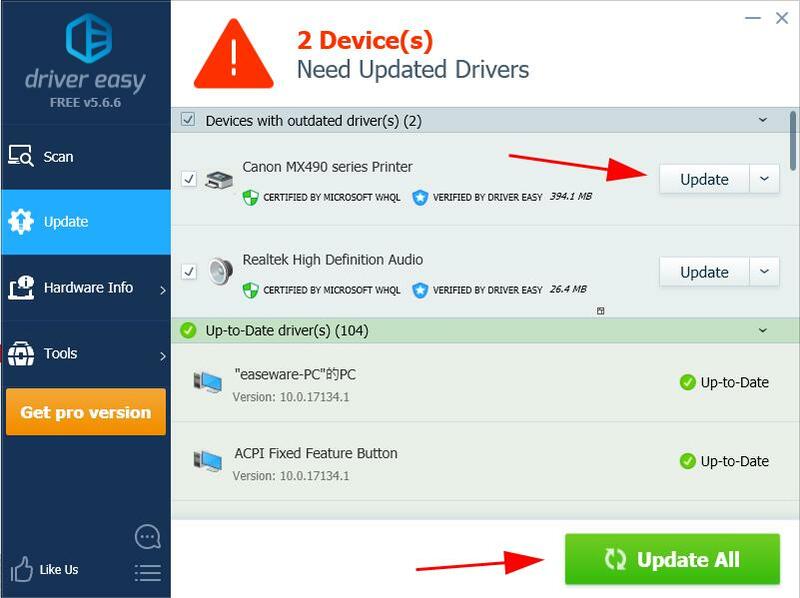 If you don’t have time, patience, or computer skills to update the drivers, you can do it automatically with Driver Easy. Click the Update button next to the printer/scanner to automatically download the driver (You can do this with the Free version), then install it in your computer. Or click Update All to automatically download and install the drivers that are missing or outdated in your system (This requires the Pro version – You’ll be prompted to upgrade when you click Update All). You should have installed the latest printer and scanner drivers that support full features. So there you have it – two effective solutions if you don’t have printer and scanner driver included in your Windows 10 OS. If you have any questions, feel free to let us know and we’ll see what more we can do.